Malahide (Irish: Mullach Íde) is an affluent coastal suburban town outside Dublin city in Fingal, Ireland. It is also a civil parish in the ancient barony of Coolock. There are extensive residential areas to the south, southeast and west of the village. The modern name Malahide may come from "Mullach Íde" meaning "the hill of Íde" or "Íde's sand-hill". It could also mean "Sand-hills of the Hydes" (from Mullac h-Íde) probably referring to a Norman family from the Donabate area. 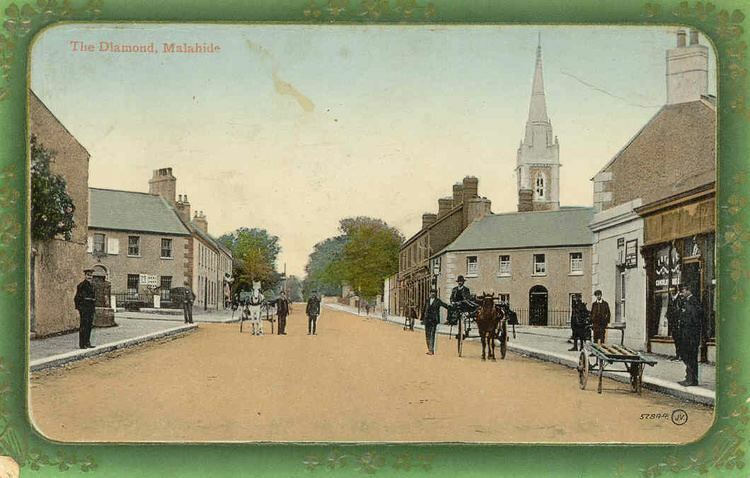 According to the Placenames Database of Ireland the name Malahide is possibly derived from the Irish "Baile Átha Thíd" meaning "the town of the ford of Thíd". Malahide Bay was anciently called Inber Domnann, the "river-mouth of the Fir Domnann". Malahide is situated 16 kilometres north of the city of Dublin, lying between Swords, Kinsealy and Portmarnock. It is situated on the Broadmeadow (Bromwell) estuary, on the opposite side of which is Donabate. The village is served by the DART and the train, run by Irish Rail. The Dublin Bus 32, 42 and 102, the 32X and 142 peak hour express services, and 42N Nite-Link route serve the town from Dublin City Centre. Route 102 serves local areas to / from Dublin Airport ( via Swords ) and Sutton Station (via Portmarnock ). While there are some remnants of prehistoric activity, Malahide is known to have become a persistent settlement from the coming of the Vikings, who landed in 795, and used Malahide Estuary (along with Baldoyle) as a convenient base. With the arrival of the Anglo-Normans, the last Danish King of Dublin retired to the area in 1171. From the 1180s, the history of the area is tied to that of the Talbot family of Malahide Castle, who were granted extensive lands in the area and over the centuries following developed their estate, and the small harbour settlement. There is an ancient covered well, St. Sylvester's, on the old main street (Old Street, previously Chapel Street), which used to have a "pattern" to Our Lady each 15 August. In 1475 Thomas Talbot, head of the Talbot family of Malahide Castle, was granted the title Admiral of the port of Malahide by King Edward IV, with power to hold admiralty courts and levy customs duties on all merchandise coming into the port. The office was hereditary, and the family's right to act as Admiral was confirmed by the Court of Exchequer (Ireland) in 1639. 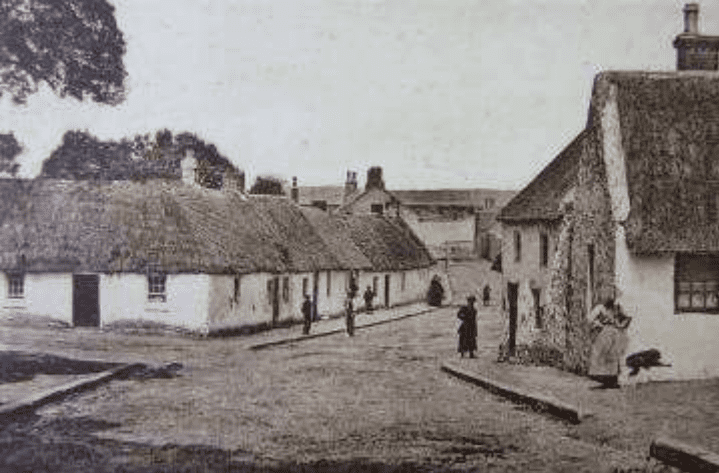 By the early 19th century, the village had a population of over 1000, and a number of local industries, including salt harvesting, while the harbour continued in commercial operation, with landings of coal and construction materials. By 1831, the population had reached 1223. The area grew in popularity in Georgian times as a seaside resort for wealthy Dublin city dwellers. This is still evident today from the fine collection of Georgian houses in the town and along the seafront, and Malahide is still a popular spot for day-trippers, especially in the summer months. In the 1960s, developers began to build housing estates around the village core of Malahide, launching the first, Ard na Mara in 1964. Further estates followed, to the northwest, south and west, but the village core remained intact, with the addition of a "marina apartment complex" development adjacent to the village green. Malahide grew from a population to 1500 in 1960 and by 2011 had a population of 15,846, and is still a rapidly growing town for the Dublin area. Most of the population lives outside the core village, in residential areas such as Seapark, Biscayne, Robswall, Chalfont, Ard Na Mara, Millview, Yellow Walls Road, Seabury and Gainsborough. In Malahide village there are extensive retail facilities and services including fashion boutiques, hair and beauty salons, florists, food outlets, and a small shopping centre. There is a wide selection of pubs (including Gibney's, Fowler's, Duffy's and Gilbert and Wright's) and restaurants and the 203-room Grand Hotel. Malahide is part of the Dáil Éireann constituency of Dublin Fingal, whose five elected representatives are Louise O'Reilly (Dublin politician) of Sinn Féin, elected in 2016; Darragh O'Brien of the Fianna Fáil Party elected in 2016; Brendan Ryan of the Labour Party, elected in 2016; Clare Daly of United Left Alliance, elected in 2016; and Alan Farrell of Fine Gael, elected in 2016. For the 2016 election held on Feb 26th, the Dublin North constituency was replaced by the Dáil Éireann constituency of Dublin Fingal. Past sitting TDs have included Nora Owen (Fine Gael), Sean Ryan (Labour), and the Fianna Fáil member G.V. Wright. Near to the village itself is Malahide Castle and demesne, including, gardens, which were once the estate of Baron Talbot of Malahide. Malahide also has a substantial marina. The Malahide area has more than twenty residents' associations, sixteen of which (May 2007) work together through the Malahide Community Forum, which publishes a quarterly newsletter, The Malahide Guardian. There is an active historical society (with a small museum at Malahide Castle Demesne), a Lions club, a camera club, a musical and drama society, the renowned Enchiriadis choirs, a chess club and a photography group which has published calendars. Aside from Malahide Castle Demesne, there are a number of smaller parks (with further spaces planned, for example, at Robswall and Seamount). There are several golf courses nearby, and GAA, soccer, tennis, rugby, yacht clubs and Sea Scouts. In 1990, Malahide won the Irish Tidy Towns Competition. Another group that has been present in Malahide for many years is the Malahide Pipe Band. The band was established in 1954 and still practices in the same original area in Yellow Walls today. The band comprises pipers and drummers playing the bagpipes and snare, tenor and bass drums. The band plays at various events locally, with main objective to play in competitions around the country in the summer months. The Band has also been involved in running a Pipe Band Competition in Malahide Castle for a number of years. The Band is always looking for new members and supporters. For more details go to the Malahide Pipe Band's website. There are also a wide variety of sports clubs within the Malahide area. Rugby, soccer, GAA sports, sailing, hockey, golf, cricket, tennis and basketball are all well represented. St Sylvesters is the local Gaelic Athletic Association club. Malahide Basketball Club was formed in 1977 and currently fields 2 senior ladies teams, 2 senior men's teams and 15 junior girls and boys teams (from under 10 to under 18). They train and play all their home matches at Malahide Community School and Holywell Community Centre. Originally Malahide Hockey Club now amalgamated with Fingal Hockey Club (formerly Aer Lingus) to become Malahide Fingal Hockey Club. An all female club they currently field four senior teams and have a junior section of nine teams aged between 7 and 16. All teams for play and train in Broomfield Malahide. Malahide Cricket Club () was founded in 1861 and is situated within Malahide Castle demesne, near the railway station. The club has over 400 members and is open all year round. The club currently fields 18 teams (5 Senior Men's, 2 Ladies, 10 youth and a Taverners side). Both the men's and women's premier teams compete (in their respective leagues) at the highest grade of cricket played in Ireland. From 2009–12 the club's ground was developed into an 11,500-capacity venue and hosted its first one-day international in September 2013 when Ireland played England, with England winning by six wickets after captain Eoin Morgan hit 124 not out on what had been his home ground in his youth. The ground is now the biggest in Ireland. This project has also seen the development of a 2nd "club" pitch on the nearby Lady Acre within Malahide Demesne. Malahide United AFC () was founded in 1944 and currently fields 60 schoolboy/girl teams, from Under 7 to Under 18, and 4 senior teams. They have two Academies, the first one catering for the 5-, 6- and 7-year-olds and the second one for the 8-, 9- and 10-year-olds. With over 1,000 registered players, Malahide United is one of the largest clubs in Ireland. The home ground is Gannon Park, which comprises two 11-a-side pitches, one 7-a-side pitch, one 11-a-side floodlit all-weather pitch, one floodlit 5-a-side/warm up all-weather pitch and full clubhouse facilities. Aston Village FC was established back in 1994. Their current home ground is Malahide Castle and a local company is their main sponsor. They have three strong senior teams competing in both the U.C.F.L and the A.U.L leagues. Although small in size they still cater for up to 100 senior players with ages ranging from 16 – 43 years of age. Atlético Malahide was established in 2015 by a group of young determined lads. Their current home pitch is Malahide Castle. Atletico's team consists of young men aged 19–20 and currently plays in the U.C.F.L. The club's ambitions are high, targeting success in both league and domestic competitions. Malahide Rugby Club is located in a modern clubhouse and sports ground opposite the scenic Malahide estuary on Estuary Road. Founded in 1922, Malahide Rugby Club had to disband during World War II due to lack of available players. However, in 1978 the club was reformed and now fields three senior men's teams, one women's team, four youth teams and six "mini" rugby teams. There are two sailing clubs situated on the estuary; Swords Sailing & Boating Club and Malahide Yacht Club. The inner, Broadmeadow (Bromwell) estuary is also the home of Fingal Sailing School and DMG Sailsports based in the 350-berth marina. Malahide Golf Club opened in 1892, moving to a new location in 1990. It has a 2-storey clubhouse completed in May 1990, with 1,000 square metres, including bars, a restaurant, conference room and a snooker room. The 17th is a notoriously difficult hole known to locals as "Cromwell's Delight", due to its narrow fairways and dominant bunkers. Malahide Sea Scout Group is situated on St. James Terrace on Malahide Estuary. It was founded in 1919 and has 583 members which makes it the largest Scout Group in Ireland. It is the largest Sea Scouting group in Europe. In 2005 the Malahide (Wednesday) skiff crew won the East Coast Triple Crown, coming first in the long distance skiff race across Dublin bay, the Woodlatimer sprint at the east coast regatta and the Lord Mayor's cup, held in Malahide that year. In 2012, the Scout and Venture sections won all 5 activity trophies for the first time in any Sea Scout Group history. There are five schools in the environs of Malahide, four primary (Pope John Paul II National School, St. Andrews National School, St. Oliver Plunkett Primary School, and St. Sylvester's Infant School) and one secondary (Pobal Scoil Iosa, Malahide). Malahide has two Catholic parishes, St. Sylvester's and Yellow Walls, and one Church of Ireland parish (St. Andrews), and also forms part of a Presbyterian community, with a church built in 1956 as the first Presbyterian church in the Republic of Ireland since 1922 (it is one of two churches of the Congregation of Howth and Malahide). Malahide railway station opened on 25 May 1844. It is now one of the northern termini of the DART system, (the other being Howth). The station features a heritage garden and an attractive ironwork canopy. The ironwork in the canopy contains the monogram of the Great Northern Railway ('GNR'), who operated the route prior to nationalisation of the railways. The railway crosses the Broadmeadow (Bromwell) estuary on a Broadmeadow (Bromwell) viaduct known locally as The Arches. The original viaduct was a wooden structure built in 1844, which was replaced with an iron structure in 1860 and a pre-cast structure in 1966-7. On 21 August 2009 the 18:07 train from Balbriggan to Connolly was passing over the 200-year-old viaduct when the driver noticed a subsidence and the embankment giving way on the northbound track. The train passed over the bridge before it collapsed and the driver alerted authorities. An inquiry is investigating the possibility that sea bed erosion is the primary cause of the collapse. A member of Malahide Sea Scouts, Ivan Barrett, had contacted Iarnród Éireann five days before the collapse about possible damage to the viaduct and a change in water flow around it. Dublin Bus provides local bus routes in the area on Routes 32, 32X, 42, 42N, 102 and 142. Route 32 connects Malahide with Portmarnock, Baldoyle, Howth Road, Raheny, Killester, Clontarf West, Fairview, Connolly Railway Station and terminates at Abbey Street. Route 32X connects Seabury, Malahide, Portmarnock, Baldoyle, Clontarf Road, Fairview, Connolly Railway Station, Saint Stephen's Green, Leeson Street, Donnybrook Village, RTÉ and terminates at UCD Belfield. Route 42 connects The Hill, Malahide Village, Seabury, Kinsealy, Clare Hall, Coolock, Malahide Road, Artane Roundabout, Donnycarney Church, Fairview, Connolly Railway Station and terminates at Eden Quay. Route 42N is Friday and Saturday only Route which serves Kinsealy, Seabury, Malahide Village, Portmarnock (Coast Road), Wendell Avenue, Carrickhill Road, Stand Road and Portmarnock. Route 102 serves Malahide Village en route to Seabury, Waterside, Mountgorry Way, Pavilions Shopping Centre, Swords Main Street, Boriomhe, River Valley and terminates at Dublin Airport. In other direction this Route serves Coast Road, Sand's Hotel, Wendell Avenue, Carrickhill Road, Portmarnock, Strand Road, Baldoyle and terminates at Sutton Dart Station. Route 142 connects The Hill, Malahide Village, Seabury, Waterside, Mountgorry Way Holywell, M1, Port Tunnel, City Quays, Saint Stephens Green, Rathmines, Palmerston Park, Dartry Road, Milltown Road, Bird Avenue and terminates at UCD Belfield. This Route operates in morning and evening peak Monday to Friday only. Malahide is the hometown of U2 musicians Adam Clayton and The Edge. Former and current residents include Brendon Gleeson, Cecilia Ahern, James Vincent McMorrow, Conor O'Brien (Villagers), Nicky Byrne and his wife Georgina Ahern, Ronan Keating of Boyzone, Irish international soccer player Robbie Keane and Vincent Browne.